Quality Floors 4 Less has an outstanding business relationship with Bedrosians – one of the largest independent tile and stone importers and distributors in the United States, providing the highest level of service possible, the best technical and design assistance available, excellent product quality and competitive pricing since 1948. We only have 2 Best-Selling Displays in our Store, so please feel free to stop-by their own Show-Room if you didn’t find what you are looking for- it’s very impressive! As an authorized Dealer, we offer better pricing on all of their products- make sure you order through QF4L to save even more! Made from natural raw materials, including linseed oil, pine rosin and wood flour, Marmoleum is biodegradable and environmentally friendly. The natural properties of Marmoleum cause it to strengthen over its life. When properly maintained, Marmoleum will retain its attractive appearance for decades. In addition, Marmoleum helps create a healthier indoor environment. Naturally occurring anti-microbial properties inhibit the growth of many micro-organisms, including allergen producing dust mites and the MRSA strains of bacteria. Marmoleum also has natural anti-static properties to repel dust and dirt, making it easier to maintain a clean and hygienic environment. Marmoleum water-based Topshield finish eliminates the need for initial maintenance and chemicals, while providing lower cleaning costs and a better long-term appearance retention. From the indoor environment to the natural environment, Marmoleum helps create better environments. Which variant is attractive for your kitchen, tile or linoleum? 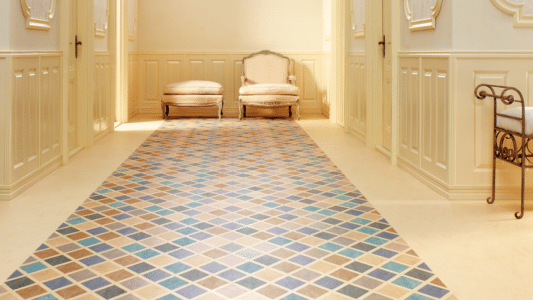 Choosing floor covering can be difficult and important decision. Some wants to use their design talent to decorate kitchen with the newest materials according to the newest standards. How about the poured floor with the original print? Nevertheless, the most of these materials are not cheap to buy and cover. Besides, you know nothing about floor capacities and characteristics. So, it is recommended to use just checked reliable materials: porcelain tile & marmoleum. Which of these surfaces are the best for kitchen? It is time to answer this hot question by comparing them together according to the most important criteria. Kitchen is one of the best visiting rooms in the house. To take the loads, the floor of your kitchen must be of high wearing power. Otherwise, it will be cracked and damaged soon. In short, the wearing characteristics of kitchen tile are higher than linoleum. To break and crack your tile you should take big efforts to use it for dozens of years. There are several classes of porcelain tile. Kitchen needs 3-5 class of tile. Linoleum can be also different wearing classes. Choosing high class linoleum you may easily even the score. The second important point is water resistance. Of course, kitchen is a place where something is dropping, spilling and wetting down. The water concentration is high. Wet climate makes a big influence over the floor surface. It must be water resistant. Linoleum cannot be damaged with water. Nevertheless, if the water comes down under the floor covering, it causes mold, dust and floor deformation. To protect your floor, you have to dry it in the best way. Speaking about tile, it is water resistant floor. Remember, the swimming pools are also covered with tile. You are not afraid of watering with porcelain tile in the kitchen. Porcelain tile & marmoleum boast with the wide assortments. It is not big, but huge. There are many different types of floor covering with different colors, textures, characteristics. There are two types of linoleum: homogeneous and heterogeneous. Homogeneous linoleum is one layer of polyvinylchloride with the nice decoration. It is protected with the thin layer of clear polyurethane. Heterogeneous linoleum is multilayered material, made of many layers of polyvinyl chloride and upper protective layer. Both of these types are attractive for kitchen. Polyvinylchloride is not the best variant for kitchen. Pay attention to the newest natural material – marmoleum. Marmoleum is not only natural, but safe material. It has many useful qualities, unlike polyvinylchloride. For example, marmoleum contains antiseptic and fungicide qualities, protecting your kitchen floor from dangerous bacteria. This is not the end! Marmoleum is water, fats, acids and ethanol resistant. It is also fire resistant. It is a pity, but linoleum characteristics are low. Why do people prefer linoleum to marmoleum? – No one can help to answer this question. Pay attention to the price. The price for linoleum is much cheaper than for marmoleum. It can happen that the price for marmoleum can be as high as the price for elite parquet. It is time to speak about the floor colors. Speaking about the colors of linoleum, the choice is wide: the variety of natural colors, marble, different forms and stony surfaces. They are called heterogeneous or synthetic linoleums. The assortment of homogeneous linoleums is much frugal – natural soft colors or marble drops. Marmoleum are also dropped or self-colored. Sometimes, you can meet the collection of other original and creative floor colors, like crocodile skin and others. Have you any preferences about your floor color? The colors and textures of the floor tiles are also different. It can be matted and glazed, different forms and colors. It is usually decorated with interesting picture. The most of modern collections consist of many tiles to compose a big picture, like flowers or butterflies. The opportunities of kitchen tile to simulate stone, parquet, metal, textile pictures are different. You can be surprised with masterful imitation of natural leather or wood. Oh, it is not only about picture, but texture of these materials. Shock resistance is a popular linoleum feature. If you dropped something, nothing will happen. Linoleum floor is difficult to crack or scratch. The only one thing that your linoleum is afraid of is fork, knife and other sharp things. Tile is easy to crack. If you dropped something heavy on your tiled floor, you can damage it. How many times a day do you usually wash the kitchen floor? You should do it very often. Of course, you want to spend little efforts to clean the floor. Actually, it is not difficult to take care of tiled floor and linoleum. To clean the floor you should take the wet dust and remove dirt. There is a set of special chemicals to take care of your floor. Nevertheless, you may use water and special soap or shampoo. What is more, the most of modern linoleums are provided with antibacterial and antifungal chemicals. Of course, it does not mean that antibacterial background safes you from the bacterial growth. Comparing linoleum and marmolium, marmoleum does need special presentation. It does not need special doping as far as the floor of marmoleum contains bactericide and antiseptic components. Touch it! Linoleum is warm and pleasant by touch. The thinner material is the more warmth it usually keeps. The best variant is linoleum with special base layer. It is not afraid of water. The tiled floor is cold. So, it can be uncomfortable to use it in winter. There is way out! You may cover your tiled floor with warm and soft rugs. You may also use under floor heating. Let the temperature of your floor be always comfortable. Have you made the right decision? Porcelain tile & marmoleum are widely recommended to use for kitchen. Try to think of pluses and minuses of each of them and decide. So, what is your choice: tiles or marmoleum?